Tsai’s lines—whether circular or straight—move. While literally static on the paper, they contain within them the energy of the artist’s gesture as they endlessly redraw themselves before the viewer. 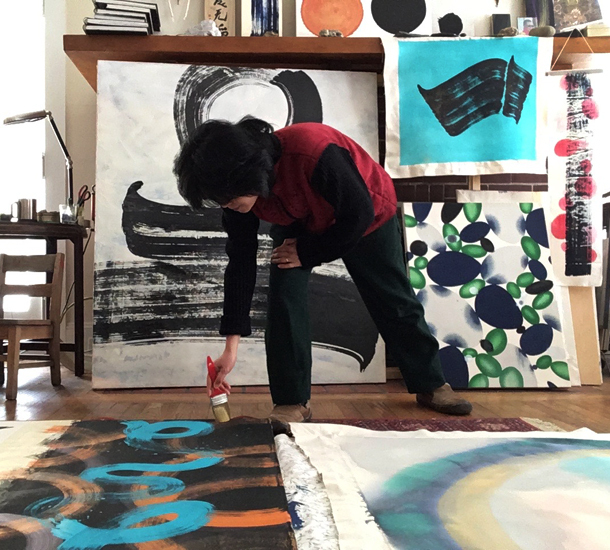 The two major traditions which inform Tsai’s work—traditional Chinese calligraphy and painting and modern abstraction—share an important kinesthetic ground. 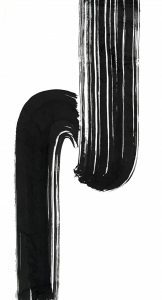 Critic Harold Rosenberg’s description of Abstract Expressionism as “action painting” is in many ways applicable to Chinese calligraphy and painting: the paper is akin to the canvas which becomes “an arena in which to act” and what we see in the finished work is “not a picture, but an event.”(8) Tsai describes the action of her painting as “dancing in space and time with the brush.”(9) Dance is a corporeal and temporal art form. What happens to all the corporeal movement of a dance as it is transferred to a painting? Where is its time? The energy or chi of Tsai’s dance is embodied in the form of works like Hooked (2017) from her “Icons” series. 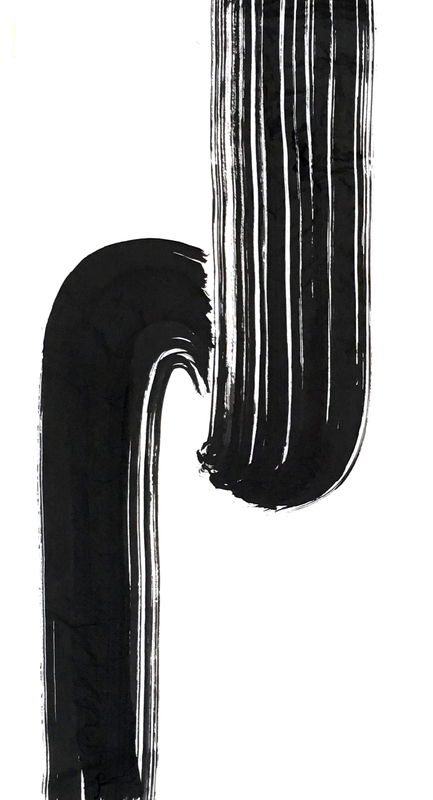 A thick black stroke broken by lines of light drives itself inexorably down the composition; but just past the halfway point the stroke stops and jerks itself impossibly upward against its own inertia, just momentarily, before gravity finally pulls it down again. As in The Concept of Time, the line in Hooked extends beyond the paper in both directions suggesting that we are glimpsing but a moment in a much larger, perhaps eternal, life of the line. The velocity and force of Hooked, and of a similar work, Waterfall 04, are monumental. We generally think of monuments as immutable and immobile; but Hooked and Waterfall 04 are monuments in motion. Their gestures are suspended in time yet always moving afresh as the viewer’s eye follows their direction and the viewer’s body feels the magnitude of their force. Monuments are erected to be timeless in order to ensure the past is remembered in the future. 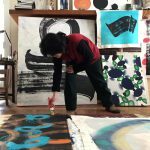 In this way Tsai’s work is a permanent record of impermanence. Within an art historical context, the title of Tsai’s “Floating World” series (2015-2016) is a witty play on the literal translation of “ukiyo-e,” a style of woodblock printmaking from Edo Japan, and it also recalls the curving profile of roofs that seem to levitate East Asian Buddhist architecture (e.g., Hoodo “Phoenix Hall” of Byodo-in Temple, c. 1053, Uji, Japan, which appears to float on the surface of the water before it); but more importantly it also suggests a rethinking of our world within the larger cosmos. Since the earth is the ground for our experience and source of the gravity that orients us, we do not usually experience or think of our world as floating. However, viewed from space, as in NASA’s Blue Marble (1972) photograph, the world is seen floating in a void. (10) Painted from an imagined celestial vantage point, works within Tsai’s “Floating World” series such as Stardust and Birth of a Planet 02 capture the sublime forces generated by cosmic entities falling in and out of being. Again the circle is Tsai’s primary motif. In Birth of a Planet 02 a yellow circle grows around a yellow dot. These circles are in turn encircled by concentric blue rings that reverberate with the power and force emanating from the small yellow point of origin. Just as the shape of Robert Smithson’s earthwork Spiral Jetty (1970, Great Salt Lake, Utah) calls to mind the spiral shape of galaxies and its counter clockwise pathway invites meditations on time, Tsai’s circles call to mind the spherical shape of the sun and the moon whose movements we use to measure time, as well as the circular, or more precisely, elliptical orbits of moons around planets and planets around stars. The massive scale of time used to measure the “life” of a planet and of the cosmos, which can be quantified in intellectual terms, remains utterly meaningless in terms of our lived, corporeal experience. From the perspective of a human life, the time of the cosmos is essentially timeless, awe-inspiring, and beyond human comprehension. But the works in the “Floating World” series do not just suggest the celestial realms. 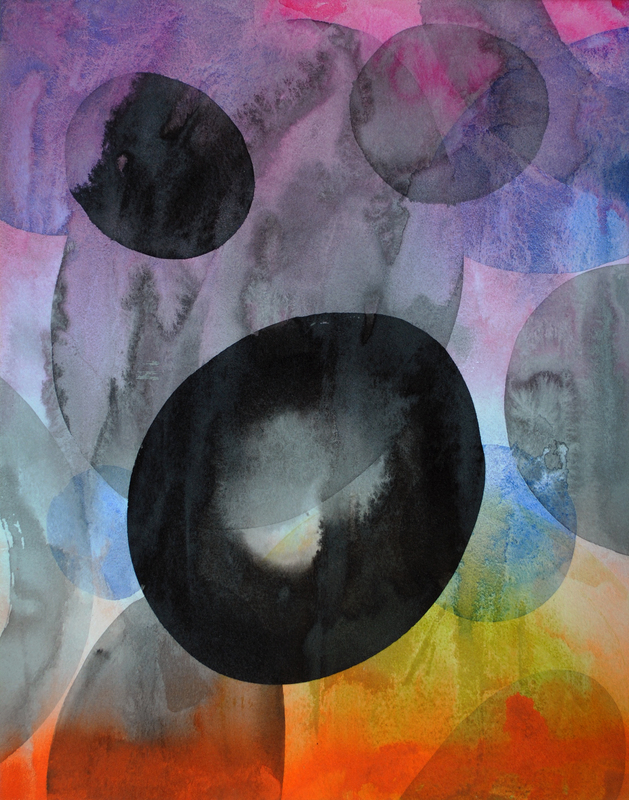 At times they look like cells, as in Stardust whose cosmic title belies its microcosmic imagery: black organic cells of various opacity and transparency floating in a primordial liquid spectrum. Stardust is the coming into being of worlds and, at the same time, the coming into being of elementary life forms. Carl Sagan famously pointed out that all the matter in our world, in our bodies, and in our cells was generated in red giant stars eons ago—we are stardust. 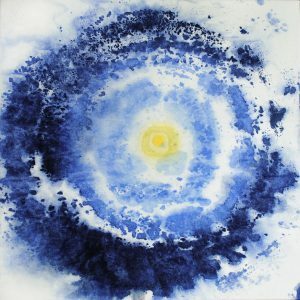 (11) Overcoming the dualism between the cosmic and microcosmic, and between the timelessness of the universe and the finitude of human time, Tsai’s work demonstrates a profound connection between all things. Reading the reference to Carl Sagan’s statement that “… all the matter in our world, in our bodies, and in our cells was generated in red giant stars eons ago…” reacquainted me with the vastness of ancestry, having initially experienced that vastness when I recently participated in the Basic Goodness 3 class, taught by Ashe Acharya John Rockwell on the Shambhala Online website.